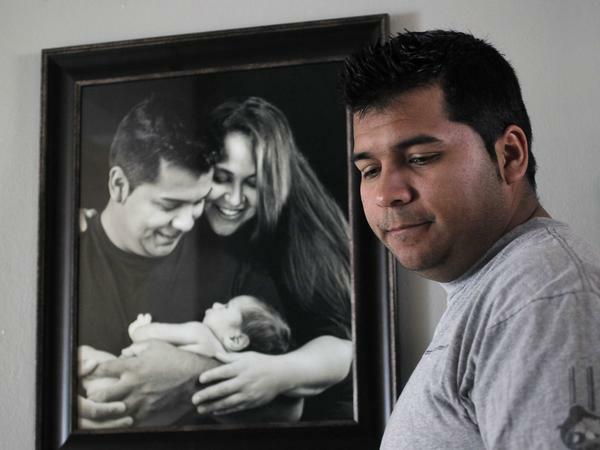 Erick Munoz stands by a photo of his wife, Marlise Munoz, at home in Fort Worth, Texas, on Jan. 3. She is being kept on life support in a local hospital against the family's wishes. 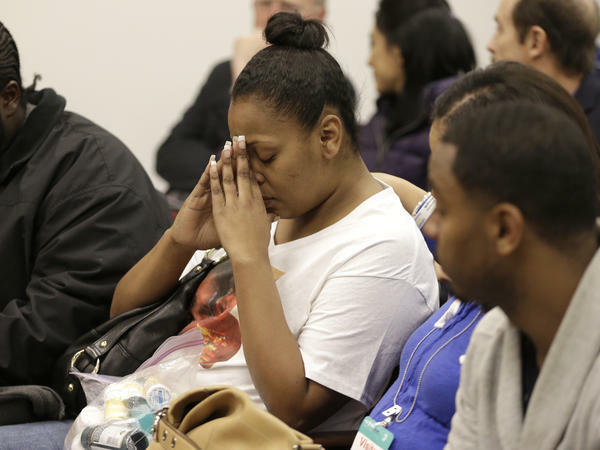 Nailah Winkfield, mother of 13-year-old Jahi McMath, at a court hearing on Dec. 20, 2013, in Oakland, Calif. The family opposed hospital efforts to disconnect Jahi from life support, even though she was declared brain dead. In Oakland, Calif., the family of 13-year-old Jahi McMath waged a legal battle to override at least three neurologists who said that the child died when her brain lost all function after complications from a tonsillectomy. Though a coroner has issued an official death certificate for her, Jahi's family won the right to keep their child on a ventilator. The husband and parents of 33-year-old Marlise Munoz in Fort Worth, Texas, were ready to accept their loss when doctors declared her brain dead after a suspected brain embolism. But Munoz was 14 weeks pregnant when she was afflicted. Because of that, the hospital has refused to remove her from a ventilator, despite her loved ones' wishes. Both cases run counter to a definition of death that has been used for decades, with rare exceptions. If a person experiences the "irreversible cessation of all functions of the brain," he or she is considered legally dead. What's confusing is that someone who is brain dead can look and feel alive — they can keep breathing with the help of a ventilator, and their hearts can keep beating. Given the right treatment, many of their bodily functions can stay intact for weeks and months after they are considered medically and legally dead. "Many people confuse brain death with coma, vegetative state or other disorders of consciousness," says Dr. James Bernat, a neurologist who directs the clinical ethics program at the Dartmouth-Hitchcock Medical Center and serves on the World Health Organization committee on standards for death determination. "In a coma or vegetative state, a person is alive," Bernat tells Shots. In both cases, there's evidence of neurological function – patients can usually breathe on their own, their reflexes might still be intact and they might respond to outside stimuli. "In brain death, there is zero brain function," Bernat says. Doctors use a slew of different tests to determine if a person is brain dead. They test reflexes and see if the patient tries to breathe when carbon dioxide levels in the blood increase. If the patient shows no signs of brain function throughout these tests, they are officially brain dead. A brain-dead person can never recover, Bernat says. The best doctors can do at that point is to offer compassion. That might mean keeping the patient on a ventilator until the family says its goodbyes. It might also mean suggesting that the family donate their loved one's organs to save someone else's life, Bernat says. "Studies have shown that this is something that can create some good out of an otherwise tragic situation." Indeed, explaining the situation to family members can be the biggest challenge for doctors, says Arthur Caplan, who heads the bioethics division at New York University Langone Medical Center. "I think some of the difficulty in medicine is not uncertainty about brain death or when death comes, it's about how to manage it," Caplan tells Shots. While hospitals should give families time to say goodbye, Caplan says, they also shouldn't keep these patients on ventilators indefinitely. In McMath's case, Caplan says, "I think doctors or nurses or facilities who ... keep dealing with this body to keep maintaining the appearance of life, they really ought to be investigated because they're not acting in an ethical manner. They're not letting the family come to an acceptance of what has happened." Media coverage of brain death can cloud public understanding, Caplan says. "I've seen headlines that have said 'Little girl brain dead, now pronounced dead,' " he says. "That gives the suggestion that maybe brain death isn't death." And beyond legal and medical definitions, life and death are rarely simple or clear-cut. Just ask any poet or philosopher. "The fight over what it means to be dead is essentially a philosophical or religious fight," says Robert Veatch, a professor of medical ethics at Georgetown University's Kennedy Institute of Ethics. "In many ways," he says, "it's the abortion question at the other end of life." To reflect that, two states, New York and New Jersey, allow doctors and hospitals take into account families' religious and moral views in determining death. "At least in New Jersey there can be living people with dead brains," Veatch tells Shots. A coroner can choose to hold off on declaring that a brain-dead person is dead if the family objects to that definition of death for religious reasons. In effect, Veatch says, as long as the family members are able to pay to keep a brain-dead relative on the ventilator, legally they can do so for as long as they'd like. There are three main schools of thought on death, Veatch says. There's the commonly accepted view that a person is dead when all brain functions cease. But there's also the view that a person is only dead after their heart stops beating. That's the view held by many Orthodox Jews and Native Americans, as well as some Catholics and fundamental Protestants, Veatch says. And there's a third variation. While most definitions of brain death mean that all parts of a person's brain are out of commission, Veatch and some others believe that a person can be brain dead even if certain minor functions of the brain remain. For example, if a patient shows a gag reflex, but no other signs of life, they should be considered brain dead. Though most laws and medical practices are based on the definition that equates total loss of brain function to death, Veatch says, "There's nothing illogical or unscientific about choosing either of the other two groups of concepts of death." It makes sense to let families choose between the three definitions, he says. "I don't see any reason why we will ever have unanimous agreement on that question."